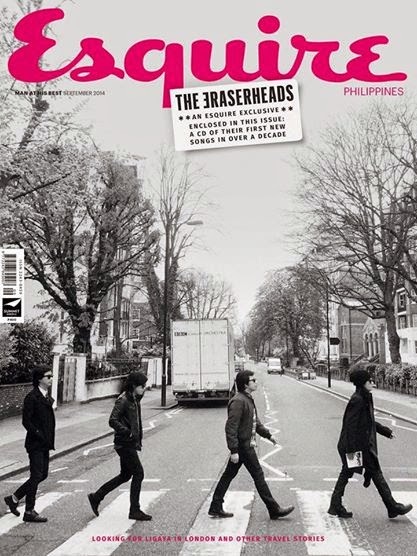 Eraserheads' new song release "1995" is just one of the two new songs presented by Esquire Philippines during the bands announcement of release just this month, September 2014. "Sabado", is the other new track released by this epic Pinoy band. Can you still remember the original band members of this legendary band from the 90's, ERASERHEADS? 1995 by Eraserheads is Nostalgic. This music video let's you reminisce the good memories of the good ol' days. One of the Songs that really marked year 1995 is "Ang Huling El Bimbo" from the Album Cutterpillow". It's music video really brings you the creeps. We're sure that kids from that generation still knows the lyrics. If not, most likely once they here the song plays they can't help but to sing along. I still remember those days where the school's boy who prepares the audio system for the flag ceremony, plays tracks from Grin Department and Eraserheads. The music video of Eheads' new song 1995 is directed by Erik Matti. This goes down to history as Eraserheads resurrection and reunion with this new video themed 1995. This only means that E-heads can be likened by any generations and generations to come. Not just another band who will fade in time. There's a lot of changes happening now in the music industry, including the digitization of almost everything. But Eraserheads, shows us that music can bind anyone even from people who chose different paths because of their own differences or grudges. 1995, "Saan, saan na napunta, kislap ng iyong mata? Maibabalik pa ba?" Can anyone relate? Share your insights about the lyric.